Marvellous performances and phenomenal players were seen today at the French Open 2018. Dominic Thiem and Marco Cecchinato from Men’s Tennis proceeded into the semifinals. Result: Dominic Thiem defeated Alexander Zverev at the French Open by 6-4, 6-2, 6-1. 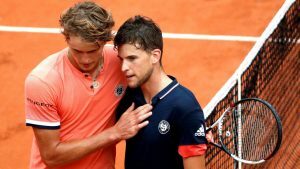 An outstanding performance was witnessed today on the court between the Austrian star, Dominic Thiem, and the German Tennis player, Alexander Zverev, in the quarterfinals of the French Open. Dominic made a good start as he lead Alexander in the first set. But Zverev recovered points quickly and the points were 4-3. Dominic Thiem eventually won the set as he executed a single-handed backhand shot which Zverev was unable to play and sealed his victory in the first set by 6-4. The second set was also an interesting one as Dominic displayed a beautiful Tennis in the clay court today. Dominic again took the lead in this set and no doubt he won this set too by 6-2. The pressure was all on Alexander Zverev who wasn’t sure enough what would happen in the next set. As he got heavy strapping on his left thigh and was literally struggling to move on the court. Soon after the break, third set started and Dominic as usual took the lead and easily won the set. Injured Zverev lost the set by 1-6 and made his way back home. Dominic Thiem booked his name into the semi-finals of the French Open 2018. Dominic will be playing against Marco Cecchinato of Italy in the semi-finals of Roland Garros. 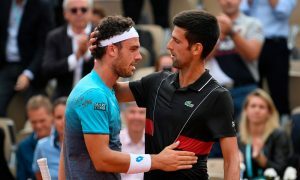 Result: Marco Cecchinato defeated Novak Djokovic the French Open 2018 by 6-3, 7-6(4), 1-6, 7-6(11). Exquisite and absolute performance from the Serbian, Novak Djokovic, and Marco Cecchinato who played at their peak in the whole match. Both players looked confident on the court today as both were standing against each other in the quarterfinals. The first set started and Novak took the lead after a few minutes but Marco was not an easy opponent to beat. Marco with some brilliant backhand and forehand shots took the lead in a very less time and won the set by 6-3. It was a tough fight in the first set but a poor start from Djokovic from which nobody was expecting that kind of Tennis. Soon the second set started and believe me it was worth watching as Novak and Marco were gaining points one after the other and nobody knew who would win this set. After a long fight between the two, the set came to a tie-break. Novak struggled hard but eventually Marco Cecchinato showed his forehand skills on the court and won the set by 7-6(4). Novak not only lost the first two sets but was also in more trouble as he was suffering with a neck problem. After some time, the third set started and Novak stunned the whole crowd by winning it from 6-1. After winning the set Novak immediately called the physio for a leg injury. Now it was all down to fourth set as Novak still played the set with two injuries. And what a sensational performance it was by the Serbian as the set came to a tie-break. At last, Marco defeated injured Djokovic by 7-6(11) on the tie. However, Cecchinato made 5 double faults in the whole match as compared to Novak who made only 2 double faults but still Marco won the match and made it to the semi-finals. Marco Cecchinato will now play against the Austrian, Dominic Thiem, in the semifinal of the French Open 2018. These were the highlights of the 1st half of the 10th day of Men’s Tennis.